State of the art regarding the dynamic analysis of monolithic plates in general is, that FEM based software is utilized to obtain results for such or similar dynamic investigations. However, a major problem of this kind of method is that transient calculations are time consuming, presuming that appropriate software and knowledge about dynamic problems are available at all. 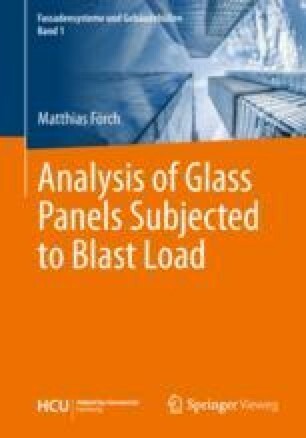 There are design charts or formulas for static analysis of rectangular monolithic glass plates under constant distributed load available in Moore (1980, fig.4,7), Sedlacek et al.